Kayaking is an outdoor water sport using a kayak, which is a canoe-like boat with an enclosed cockpit. A kayak may have one opening (a single person kayak), or it may have two or more openings (multi-person kayak). Kayaks are made of molded plastic and fiberglass, aluminum alloys, or other materials. They are wide at the center and taper at the front and back. Skirts seal out water from entering the cockpit. There are different varieties and sizes of kayaks, but touring kayaks are generally longer and narrower, while whitewater kayaks are shorter and wider. Whitewater kayaks have an upturned front and rear, or more "rocker" than a touring kayak. Less rocker creates more stability, but more rocker provides more maneuverability. The kayak is propelled through the water by a paddle made of wood, aluminum, or fiberglass. The paddle has two curved blades; one on each end of the shaft. The blades are usually at 90 degree angles from one another. Kayakers are in a seated position with their legs extended in front of them. The kayaker grips the shaft of the paddle and dips one blade into the water ahead of the body. The blade is pulled through the water toward the kayaker. This blade is then lifted from the water while the other blade is simultaneously dipped into the water on the other side. Equal pull on both sides enables the kayak to move forward in a straight path. Pulling more to the right turns it to the left, and pulling more on the left helps the boat turn right. 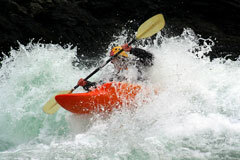 White water kayaking and sea kayaking have become popular manifestations of the sport. White water kayaking involves kayaking through rapids, while sea kayaking, also known as ocean kayaking, is practiced on the ocean or another open water source. Sprint kayaking involves races between individuals or teams for a distance of 500 to 1,000 meters. Kayaks have been used for travel and recreation across many cultures for centuries. The kayak was invented by Native Americans known as the Inuit. These kayaks were constructed with the oiled hides of sea mammals. The hides were stretched over a framework of wood or whale ribs. Much like kayakers today, the Inuit used a double paddle to propel their boats through the water. Kayakers should be confident swimmers and always wear life vests. A helmet is also recommended to protect the head against rocks and other objects. This is especially important in whitewater kayaking, where the water can be rough and the course unpredictable. New Jersey-based retailer offers a wide selection of outdoor gear and apparel. Retail store has a well stocked climbing department plus a full service bike shop and an extensive water sports section. North Carolina firm features a popular selection of recreational, sit-on-top, touring, and sporting kayaks, as well as paddles, sprayskirts, pfds, and other kayaking accessories. Established in 1903, this Maine firm offers both canoes and kayaks for recreation, touring, and sporting. British Columbia firm builds premium touring kayaks, paddles, and outriggers from composite materials. Designer and leading manufacturer of popular sit-on-top kayaks offers sea kayaks and accessories. This manufacturer of modern kayaks features whitewater, touring, recreational, and sit-on-top models. South Carolina designer and manufacturer of whitewater, touring, and recreational kayaks. Features a selection of ergonomically advanced whitewater and touring paddles. Wisconsin firm offers performance paddles for kayaking and canoeing. Offers a comprehensive line of technical paddling apparel suited to challenging weather and water conditions. 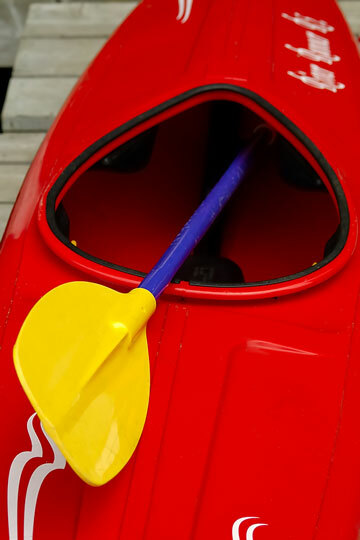 Online resource for information about sit-on-top and open-cockpit, self-bailing kayaks. Information on hardshell and inflatable kayaks, kayaking, and kayak gear.